ULMA provided comprehensive services, from the bid and design to material provisioning and closing the project. One of the key factors in the decision to rely on ULMA as a supplier was the comprehensive technical solution proposed, as well as its logistical capacity to provision the tonnes of material necessary on schedule. Coordination with the client and acontinual onsite presence allowed ULMA to respond effectively and rapidly to any circumstances that arose in the project. ULMA was responsible for the transverse section of the approach span decks, the piers, pylons, and pier segments of the bridge. The project consists of eight piers with heights ranging from 12 m to 36 m. The piles are rectangular, measuring 2 m by 6 m and 3.4 m by 6 m, with chamfers at the corners and midline of the section. The pier cap is curved with a radius of 18.8 m and reaches a height of 8 m. The formwork employed for the piers, both in the rectangular and circular sections, was the ENKOFORM V-100 system supported by CR-250 climbing brackets. 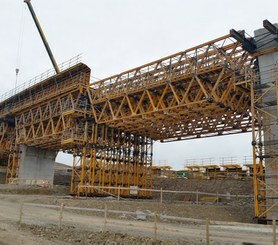 The climbing assemblies were 6 m in height, featuring two stories of working platforms for pouring and auxiliary jobs. 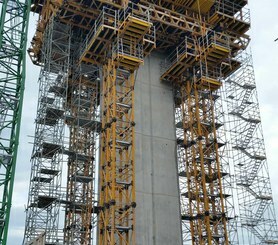 The same formwork assemblies were reused to complete the three pylons with heights ranging from 16 m to 27 m and variable sections. The 21 m trusses and 36 m shoring towers are extremely durable with a high load-bearing capacity, easily capable of spanning large distances, making them indispensable in the soft ground present on both sides of the riverbank. The pier segment for piles four and five, measuring 21 m wide and 12 m long, was built using ENKOFORM HMK and backed by two shoring systems. 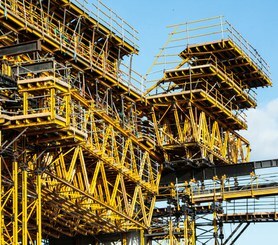 The formwork system was divided into five distinct assemblies: one of 3.4 m set on the pile and shored by T-60 towers reaching 23 m in height, and four of 2.5 m supported by eight MK Trusses and MK Towers. 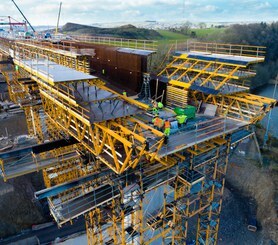 The formwork assemblies were connected longitudinally with a profile 12 m long.